Being a successful burglar requires stealth and finesse, and also the ability to resist the temptation to snack and nap while on the job. A prowling thief broke all of these rules yesterday in Petaluma, Calif., and is now chilling behind bars, presumably wondering if it was worth it to inhale all those tater tots. 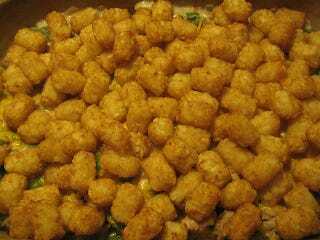 A hungry California burglar broke into a Sonoma County home on a thieving mission, but got distracted when he found tater tots in the freezer, police said. He made a snack, fell asleep and got busted when the homeowner found him napping on the couch. This happened in broad daylight, mind you, and the homeowner was upstairs the entire time. At around 2 p.m., she came downstairs and discovered a strange man snoozing on her couch, presumably surrounded by the greasy remains of his tater tot frenzy. The understandably freaked-out woman dialed 911, then made a break for safety. Her hasty exit awoke the sleeping bandit, who took off out the back door and tore through a neighbor’s fence in his haste, according to SF Gate. He was soon captured (after being Tased), and identified as James Adams, a man with a lengthy rap sheet in California and Oregon. His current address is the Sonoma County Jail, which has some less-than-glowing Yelp reviews of its cuisine (yes, really). Tots are not mentioned. Every goddam day, B’fast; cornflakes, milk, bread, hard boiled egg. Lunch; baloney sandwich, soggy cookies, milk, rotten orange. Dinner; mystery meat, over boiled veg, bread, poisonous lemon aid mix. You can buy extra junk food through commissary at a ridiculous mark up twice a week. What a racket. I came out sick as a dog. I think it’s from not seeing the sun once and the crap food.